Follow along as LMR walks you through step by step on how to install aftermarket 2015-2019 Mustang shocks and struts on your S550. Improve ride quality and handling in your lowered 2015-2019 Mustang with Steeda's Pro-Action shock and strut kit! Steeda specifically designed this kit to work with lowered suspension. Street and track technology has been combined to achieve maximum compression valving which provides quicker reaction while driving. This kit features rebound adjustability to improve ride comfort on the street, or to stiffen things up at the track. This eliminates choppy stock ride, reduces nose dive, as well as wheel hop. Remove both front wheels & both rear wheels. Starting in the front, remove the two 15mm brake caliper to spindle retaining bolts and set the caliper on the rear of the k-member. Use a plastic pry tool to remove the two harness clips from the factory strut. To make some room, disconnect the MAF sensor connection and remove the push pin from the air box. To remove the sway bar end link from the strut, use a 17mm open end wrench on the end link stud and an 18mm deep socket on the nut. Once the nut is removed, position the end link out of your way. Support the lower control arm with a jack. Loosen and remove the two 24mm strut to spindle retain nuts. 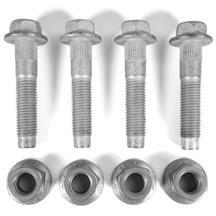 Flip these around and rethread them back onto the bolt. Ensure that the flange on the nut is even with dog point on the bolt. Strike each bolt with a hammer until the bolt is free from the spindle. Leave these in place and then remove the strut shaft retaining nut with a 21mm socket.This method will allow the spring to be removed from the strut without the use of spring compressors. Carefully lower the jack until the spring is unloaded. Remove the strut to spindle hardware followed by the strut and spring. On the strut tower, remove the three 15mm upper strut mount retaining nuts. Be sure and hold the mount with one hand to keep it from falling on the ground. Go ahead and set this aside. With everything on a work bench, remove the spring, bump stop and lower isolator from the factory strut. Compress the spring, position the strut into spring making sure the lower pigtail is aligned with the lower isolator. Make note of the spring mark on the upper isolator; install it onto the spring and align it with the upper pigtail. 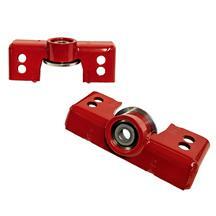 Install the Steeda camber plate onto the bearing assembly and make sure it fully seated. 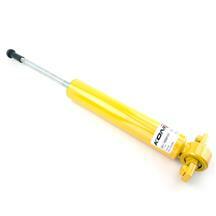 Apply blue Loc Tite to the strut shaft threads. Position the lock washer over the shaft and then thread on the nut. Finger tighten the nut and then release the spring compressors enough to establish some preload. Torque the nut to seventy pound feet. 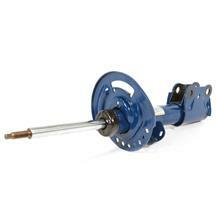 Fully remove the strut and spring assembly from the spring the spring compressors. Ensure that the tapered point on the plate is facing toward the outside of the car. Position the strut assembly into the car. Place a washer over the stud followed by a nyloc nut. When tightening the three nuts, make sure the strut shaft is centered within the strut tower opening. Fully torque each 17mm nyloc nut to thirty-seven lb-ft. Position the spindle into the strut and align the hole openings. Install two new splined bolts through the strut and spindle. Thread on two new nuts and fully torque to 184 lb-ft. Position the end link into the strut and torque the 18mm retaining nut to 85 lb-ft.
Reattach the two harness clips. Reinstall the rotor and use a lug nut to hold it in place. 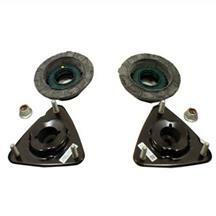 Reposition the brake caliper and torque the two 15mm retaining bolts to 85 lb-ft.
Be sure and remove the lug nut before reinstalling your wheels & repeat these steps for the other side. Moving to the rear, remove the two upper shock bracket bolts with an 18mm socket and pull the shock bracket away from the two studs on the body. Underneath the control arm, remove the two 15mm retaining bolts and then remove the factory shock from the car. Remove the dust cap from the upper shock bracket. Loosen and remove the 13mm retaining nut. Remove the upper shock bracket followed by the bump stop and dust cover. Using a 12mm drill bit, drill out the upper shock bracket. Be sure and use plenty of lubrication. Clean the bracket and then debur the hole. Remove the two nuts and small spacer from the Steeda shock. Ensure that the nylon washer is in place and then transfer the bump stop and dust cover. The flat side of the bump stop will be facing toward the top of the car. Place the upper shock bracket over the shaft with the counter sunk hole facing down. Slide the small spacer over the shock shaft followed by one of the supplied nuts. Torque the first nut to 22 lb-ft. Apply some blue Loc Tite to the threads, and then snug down the second nut. Position the shock into the car and loosely thread the two lower 15mm bolts. Push down on the shock to place the upper bracket underneath the studs on the body. Reinstall the two 18mm bolts and fully tighten. Fully tighten the lower 15mm bolts. Repeat these steps for the other side. Before reinstalling the wheels, set the rebound rate of the rear shock. Rotate the valve with the provided tool all the way to full soft which is the clockwise direction. Steeda recommends one full turn back from this for daily driven Mustangs. Count the flats on the tool and rotate the valve counter-clockwise one full turn. Do the same for the front strut. Reinstall all of the wheels and get the car on the ground. Double check your work, take the car for a test drive, and then you’re all finished. 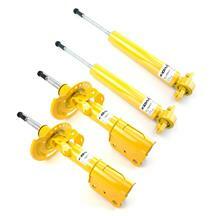 Steeda Pro-Action Shocks & Struts. 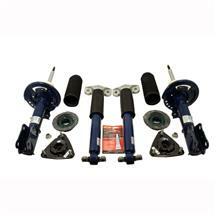 Improve ride quality and handling in your lowered 2015-2018 Mustang with Steeda's Pro-Action shock and strut kit! Steeda specifically designed this kit to work with lowered suspension. Street and track technology has been combined to achieve maximum compression valving which provides quicker reaction while driving. 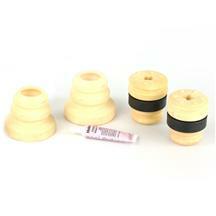 This kit features rebound adjustability to improve ride comfort on the street, or to stiffen things up at the track. This eliminates choppy stock ride, reduces nose dive, as well as wheel hop. Steeda has been a staple name in the Mustang community for many years. They have achieved this due to the high quality parts they continue to produce. This Pro-Action shock and strut kit is no exception. 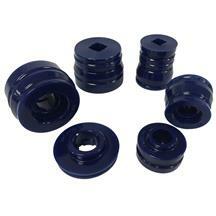 This kit starts off with a high-strength steel housing finished in Ford blue paint. Internals include twin tube dampers with a separate compression piston to provide the same force as a standard damper with less gas and internal pressure. This means less friction and stress with bulletproof reliability! - Will NOT fit GT350. - Modification of the stock rear stock mount is required for proper installation. How’s it going everyone? Landan with LMR.com and in this video I’ll be taking a look at Steeda’s adjustable Pro Action shocks and struts and how they will drastically improve the handling in your lowered S550 Mustang. 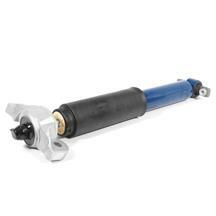 If you’re like us here at LMR and like to have a well-balanced daily driver that can easily handle the occasional track outing; well then, you need a set of Pro Action shock and struts from Steeda. We opted for the adjustable version for our 2018 Mustang GT shop car because of the fine tuning that we demand when we take the car from track to track. This shock and strut package will allow you to incorporate your stock or aftermarket springs to these dampers for the ultimate in performance and ride quality. The Pro Action shocks and struts will eliminate the choppy feeling from the factory setup, reduce dive, squat and body roll, and minimize the awful wheel hop that unfortunately plagues the S550 cars. Each Pro-Action damper will feature a twin tube design with Steeda’s proprietary shock valving and include a separate internal compression piston to give you the same compression force as a standard damper with significantly less gas and internal pressures. This simply means less internal stress on the components, less friction, and more repeatability. The rebound is easily dialed in thanks to the provided key from Steeda and that the adjustment locations are on top of both the shock and strut. In the box will be two front struts and two rear shocks. As far as modifications and fitment is concerned; this kit will fit all 2015 to 2018 V6, Ecoboost, and GT Mustangs. It will not fit S550 cars equipped with the factory Magneride option. The only modification that is required for this kit is the drilling of the rear upper shock bracket. It takes all of five minutes to do and all you need is a 12mm drill bit. 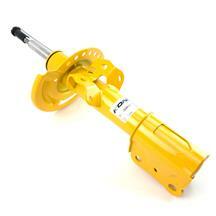 Before you begin the install, make sure to have on hand a set of spring compressors. If you don’t have any, borrow some from a friend or rent a set from your local auto parts store. I’ll be starting in the front and removing the two 15mm brake caliper to spindle retaining bolts. Set the caliper on the rear of the k-member. Use a plastic pry tool to remove the two harness clips from the factory strut. To remove the sway bar end link from the strut, use a 17mm open end wrench on the end link stud and an 18mm deep socket on the nut. Once the nut is removed, position the end link out of your way. Flip these around and rethread them back onto the bolt. Ensure that the flange on the nut is even with dog point on the bolt. Strike each bolt with a hammer until the bolt is free from the spindle. Leave these in place and then remove the strut shaft retaining nut with a 21mm socket. 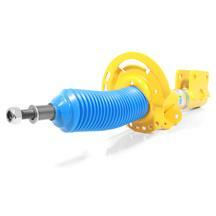 This method will allow the spring to be removed from the strut without the use of spring compressors. Carefully lower the jack until the spring is unloaded. Remove the strut to spindle hardware followed by the strut and spring. On the strut tower, remove the three 15mm upper strut mount retaining nuts. Be sure and hold the mount with one hand to keep it from falling on the ground. Go ahead and set this aside. Position the lower isolator onto the Steeda strut, followed by the provided nylon washer, and bump stop. Apply blue Loc Tite to the strut shaft threads. Position the lock washer over the shaft and then thread on the nut. Finger tighten the nut and then release the spring compressors enough to establish some preload. 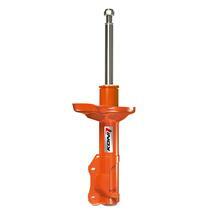 Torque the nut to seventy pound feet. 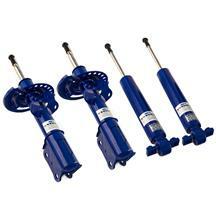 Fully remove the strut and spring assembly from the spring the spring compressors. Before installing the strut assembly into the car, remove the nuts and washers from the camber plates. Ensure that the tapered point on the plate is facing toward the outside of the car. Position the strut assembly into the car. Place a washer over the stud followed by a nyloc nut. When tightening the three nuts, make sure the strut shaft is centered within the strut tower opening. Position the spindle into the strut and align the hole openings. Install two new splined bolts through the strut and spindle. This hardware is torque to yield so new hardware is strongly recommended. Thread on two new nuts and fully torque to 184 lb-ft.
Be sure and remove the lug nut before reinstalling your wheels. Moving to the rear of the car. Remove the two upper shock bracket bolts with an 18mm socket. Pull the shock bracket away from the two studs on the body. Remove the dust cap from the upper shock bracket. Loosen and remove the 13mm retaining nut. Remove the upper shock bracket followed by the bump stop and dust cover. Using a 12mm drill bit, drill out the upper shock bracket. Be sure and use plenty of lubrication. Clean the bracket and then debur the hole. Remove the two nuts and small spacer from the Steeda shock. Ensure that the nylon washer is in place and then transfer the bump stop and dust cover. The flat side of the bump stop will be facing toward the top of the car. Torque the first nut to 22 lb-ft. Apply some blue Loc Tite to the threads, and then snug down the second nut. Position the shock into the car and loosely thread the two lower 15mm bolts. Push down on the shock to place the upper bracket underneath the studs on the body. Reinstall the two 18mm bolts and fully tighten. Fully tighten the lower 15mm bolts. Rotate the valve with the provided tool all the way to full soft which is the clockwise direction. Steeda recommends one full turn back from this for daily driven Mustangs. Count the flats on the tool and rotate the valve counter-clockwise one full turn. Do the same for the front strut. Reinstall all of the wheels and get the car on the ground. Double check your work, take the car for a test drive, and then you’re all finished. Alright guys, as far as installation goes, I would set aside a few hours to get this one knocked out. Shocks and struts are pretty straightforward on the S550 cars, and most people with adequate mechanical ability shouldn’t have a problem. I’ll be the first to tell you that this kit is going to be pretty killer once I can hit the track. Just driving around on these dampers I’ve noticed a HUGE improvement in ride quality and would strongly recommend this Steeda adjustable Pro-Action damper kit to the S550 Mustang enthusiast. To see more products from Steeda for your Mustang, be sure and subscribe to our YouTube channel if you haven’t already done so. This Steeda adjustable Pro-Action shock and strut kit is currently available from the real Mustang enthusiasts, LMR.com!